Rajasthan is much famous for its culture and heritage that is followed by the people of Rajasthan since very long time. Its culture and heritage are very rich and famous worldwide. Also, the Rajasthan is a very traditional state. Its traditions are also very rich. The people there are very joyful and helpful. The dresses in Rajasthani culture is also much famous for its beauty and royalty. 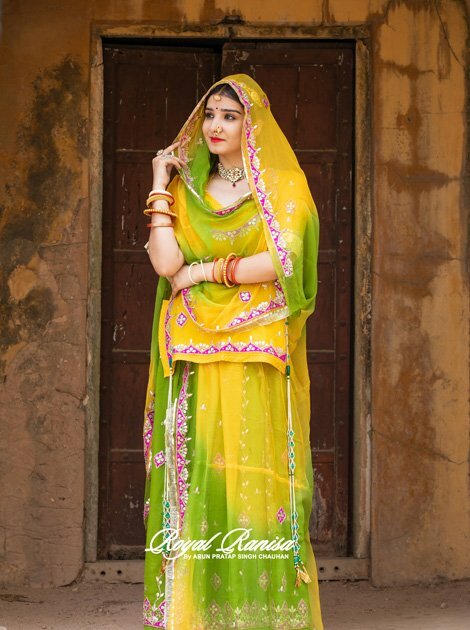 Bridal Rajputi Poshak is a Rajasthani dress which is known to be a royal dress of Rajasthan. This dress earns a badge of royal dress because it is famous since the time of Maharanis in Rajasthan. The queens of Rajasthan words the Rajputi poshak as their attire. Since then this royal dress becomes a part of royalty for Rajputs and known to be the royal dress of Rajasthan. Weddings in Rajasthan is also very famous across the globe. It is purely a traditional wedding with a reflection of their rich culture and heritage. Rajputi weddings are so much royal and joyful as they celebrate it with pure tradition. 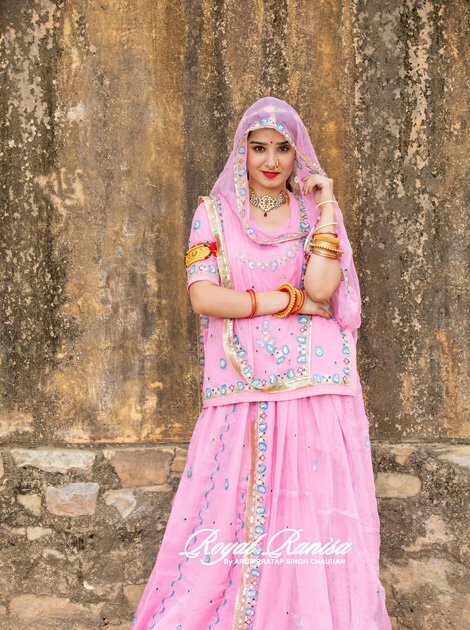 Rajasthani Bridal Rajputi Poshak is a much famous dress for brides and women to wear at weddings. Bridal rajputi poshak gives a feel of royalty to the one who wears it because it is considered as the Rajasthani royal dress. The Bridal Rajputi Poshak comes in bright contrasting colors and heavy handwork embroideries. Red is the most favorite color of many Indian brides but the colors like orange, bright yellow and appealing pink are also loved by them. There are also many pieces of jewelry worn by the Rajputi brides to adorn various body parts. Bridal Rajputi Poshak consists of four pieces. Kanchali is an upper garment of the Bridal Rajputi Poshak. For providing traditional touch to kanchali it is adorned with the mirror work, Gotta Patti, beads and sequins, coral and shells, Kundan work and creative cutwork. It is an uppermost garment which is worn with the combination of kanchali. The kurti is usually a sleeveless garment. In Rajasthan skirt is known as Ghagra. It is a long skirt which has the form of a simple and flared gored skirt. The ghagra is an embroidered and pleated skirt which covers the full legs. There are many varieties, color, designs, prints comes in the Ghagra to choose from. it is a long piece of transparent cloth which is usually made with the mild fabric. By adding patches, embroidery work, and light zari work a touch of embellishment is given to the odhani which adds beauty to Bridal Rajputi Poshak. The Rajputi bride wears a Bridal Rajputi Poshak for the wedding ceremony that is mainly red in color but the colors like orange, yellow, gold or pink poshaks are also being worn. There are also traditional items of jewelry worn by the bride that have their own importance. A bright parrot green color is particularly favorite of a particular Rajputi clan. There would be the Rakhdi, the Sheesphul as a headgear, the Aad as a thick neck hanging, hanging earrings, the Timaniyaan, the Chooda, the Bajuband at elbow on arms, the Poonchis and the Bangdis as thick golden bangles in arms, the Hathphuls on hands, the Pajeb or Payal and the Bichhiya and finally a stone studded nose ring which is known as “Nath” in Rajputs. Royal Ranisa is the best place to purchase the Bridal Rajputi Poshak in Jaipur. Embroidery work on Bridal rajputi poshaks at RoyalRanisa is done by the workers and artisans who have years of experience and knowledge in doing it. That is the reason they provide outstanding designs of Bridal Rajputi Poshak in Jaipur. We have a lot of collection of Rajputi Poshak In Jaipur at an affordable price. The Rajputi bride wears a Bridal Rajputi Poshak for the wedding ceremony that is mainly red in color but the colors like orange, yellow, gold or pink poshaks are also being worn.